Ancient Stones - Borders - 002 White Stone, Innerleithen Road, Peebles. "So called because it is a quartz rock believed to have been carried to this location during the Ice Age. 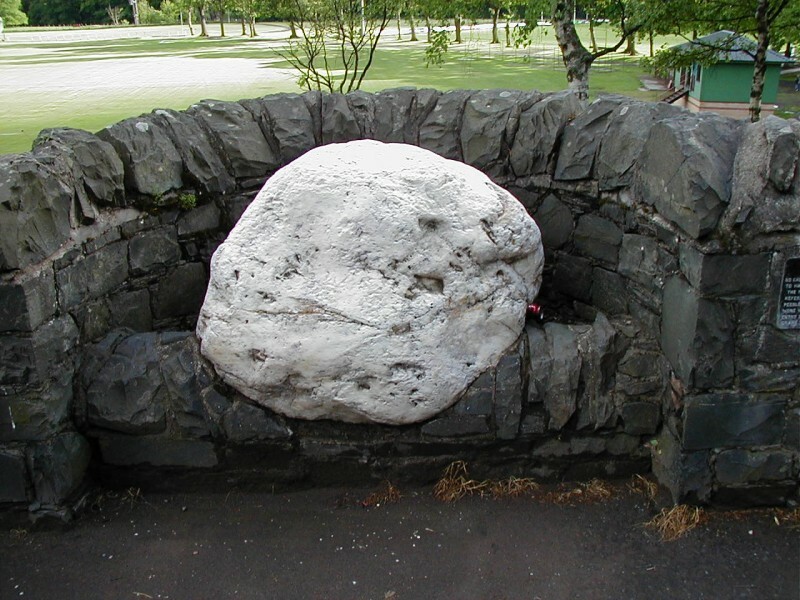 The White Stone is frequently referred to in the records of the Burgh of Peebles. It became the spot where visitors were welcomed by the magistrates on their entry to the town and where parting guests drank from the stirrup cup." From Station Road car park in Peebles, walk south towards the town centre. Immediately turn left and follow Innerleithen Road running to the west. Cross over the road at the roundabout and continue. The stone is situated on the south side of the road (A72) opposite the entrance to Peebles Hotel Hydro. "The Quhyt Stane on the north half of the gat rekand to the Wenlaw". You can work that one out for yourself! To date, no other folklore has been found relating to the White Stone, but it is interesting to note that quartz boulders or stones are often found at ancient sites and, just perhaps, the White Stone may have had some folklore or tradition associated with it in the past, sadly now long forgotten. Despite not being a traditional standing stone, the "Quhyt Stane" is impressive, sitting proud in a small alcove beside a busy main road. Perhaps the most amazing thing is that it has survived for more than 500 years and once served as a boundary stone for the borough of Peebles. The best time to see this stone is at night, under a full moon, when the stone seems to glow with its own inner light. Okay, not really a stone for the megalithic enthusiast but for those with an interest in stones, well worth a visit. Some say that a face if sometimes visible on the stone, if the light is just right!